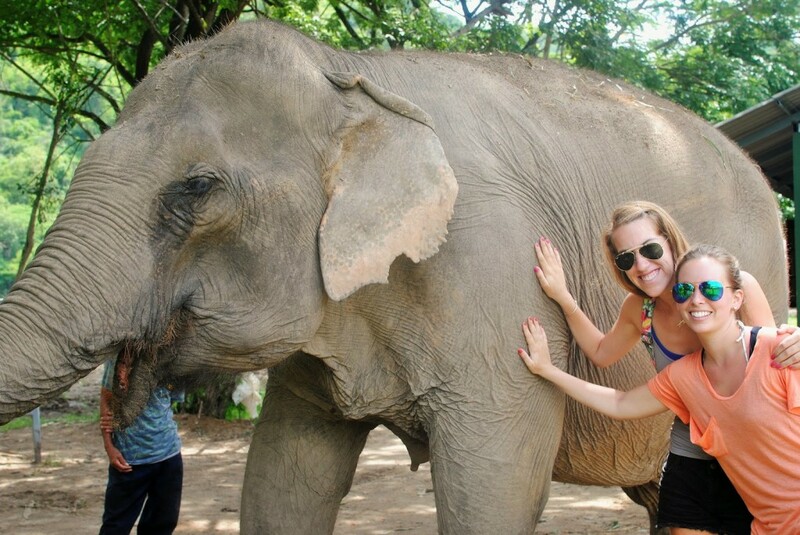 For as long as I’ve known I was traveling to Thailand, I have wanted to visit the elephants. 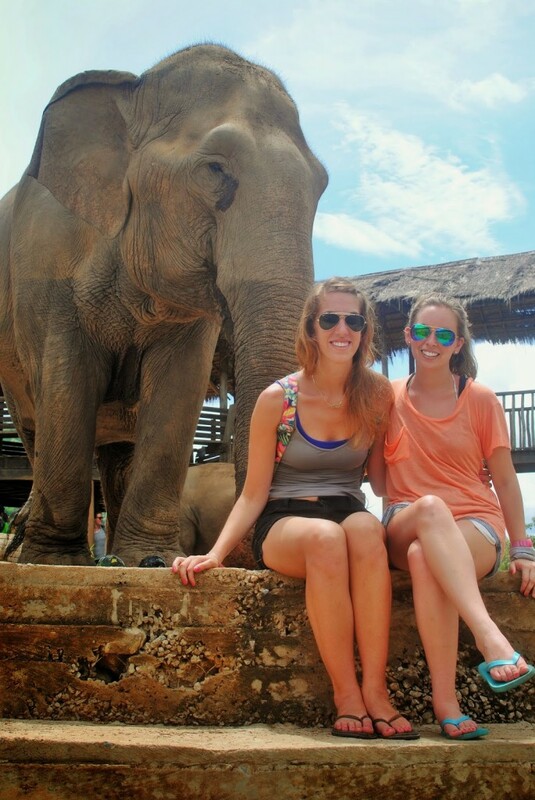 Elephants are a huge part of the tourism industry here, but parks often strap saddles or seats on their back and make the elephants carry people for long treks. They are treated inhumanly during training and suffer injuries forcing them to retire when they can no longer earn their trainers money. I have never thought of myself as an animal rights activist but definitely love animals and have always enjoyed learning about them or seeing them. I’m not one of those people who get sad at the zoo. 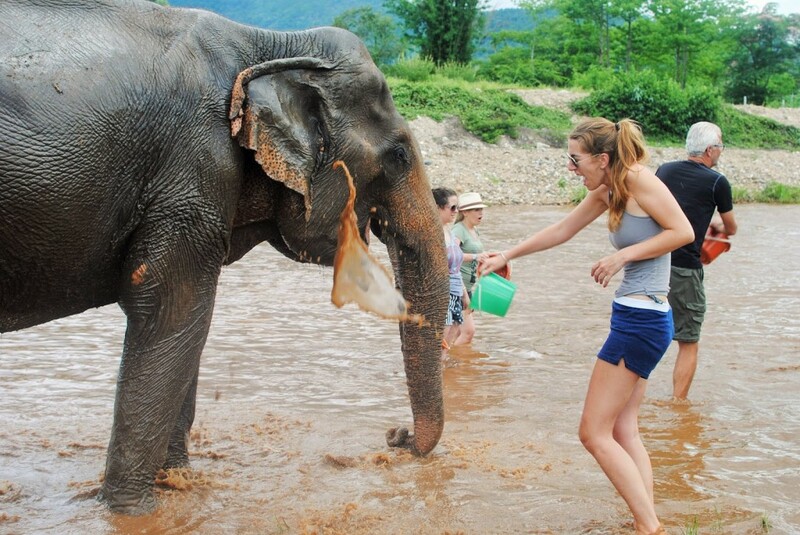 I hardly thought twice when I decided to book our reservations at the elephant sanctuary as opposed to a tourist camp, it just seemed like the best experience because I had received so many recommendations for it, some urging me that it was a much better attraction to support. 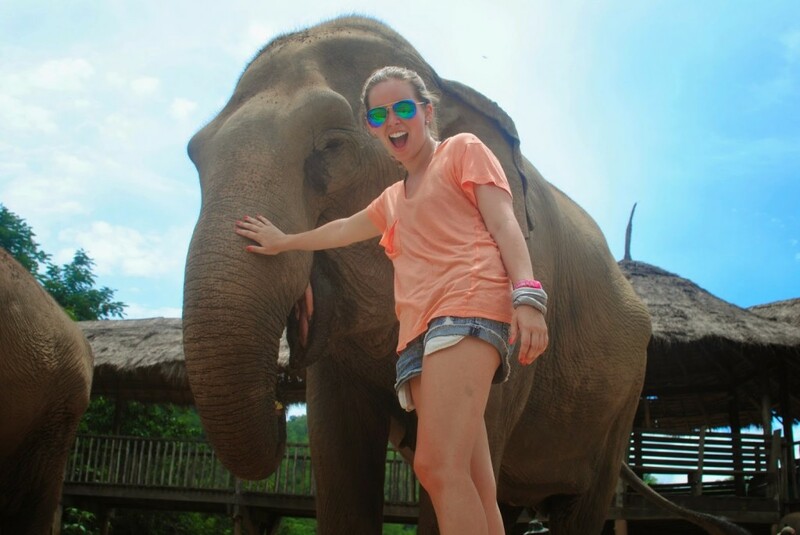 I went ahead and booked a day trip to the Elephant Nature Park outside of Chiang Mai. We had to do this in advance because they only let a certain number of visitors in a day and thus book up fairly fast. We were picked up at 8 AM and brightly greeted by our elephant cowboy, Andy. Decked out in a Texas longhorns belt buckle, a cowboy hat and crocs, he would be our guide for the day. We watched a movie about elephant treatment and the development of the sanctuary on the hour long drive to the park. 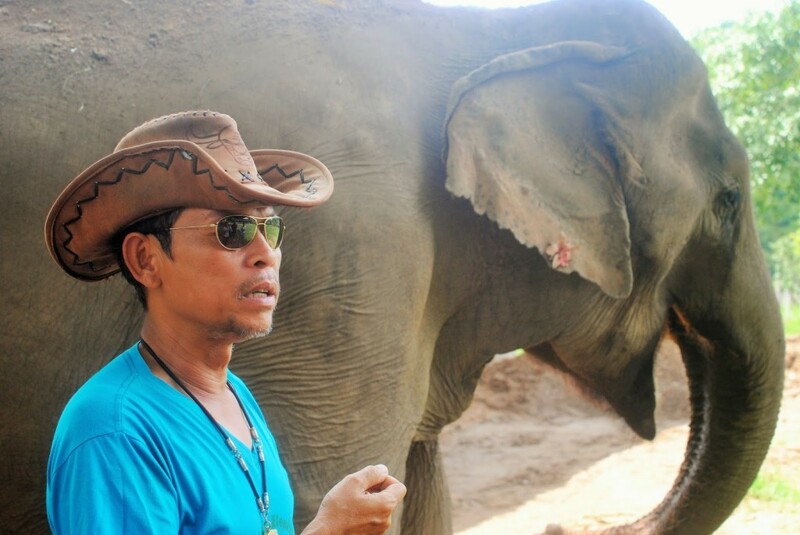 To be honest it was a bit cheesy (ending with a conservationist music video.. yeah, still not sure what that was) but I was glad to learn about the elephants we would soon visit and their owner, Lek. 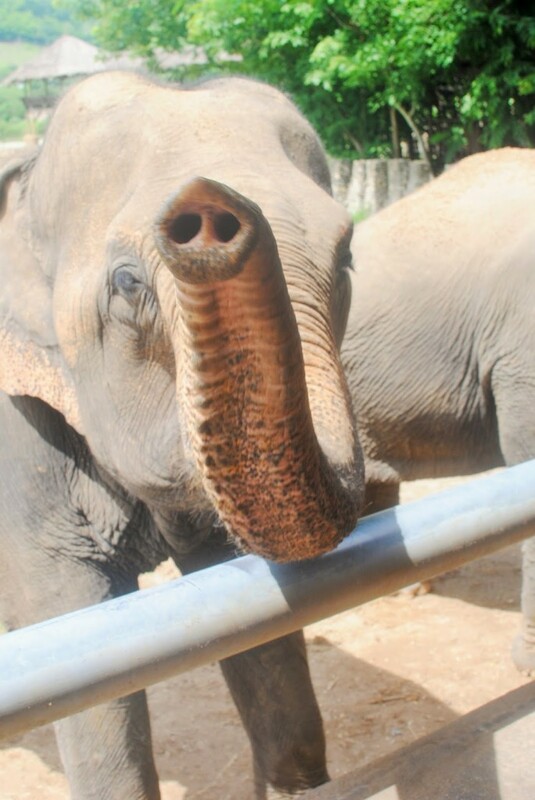 Our first activity at the park was feeding the elephants. 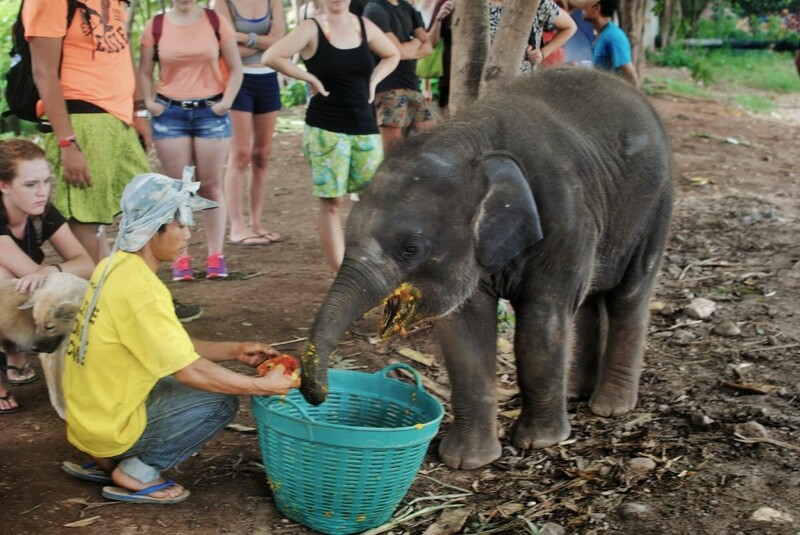 Our group was small, about 8 people, and we received a large basket of fruits and pumpkins to feed to our assigned elephant. 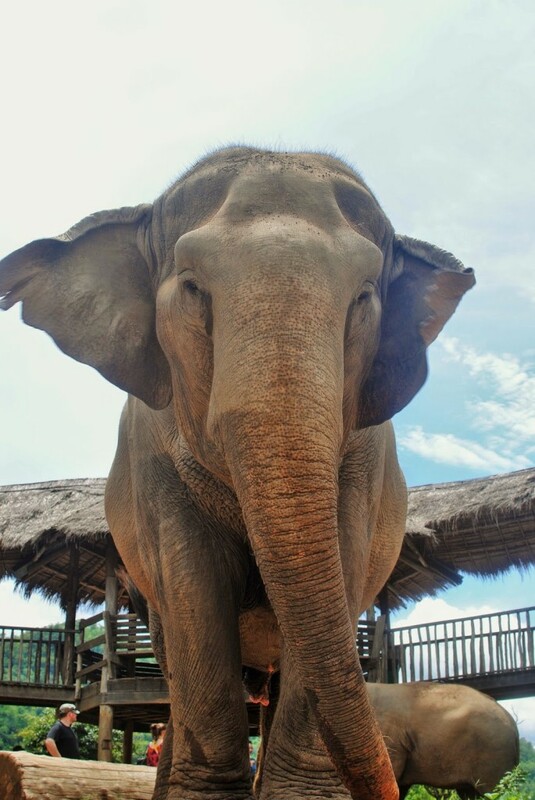 She was blinded from ill treatment as a work elephant so we had to stand back and hold out the food for her to find. We got much closer to the next one, actually walking right up and petting her. She could see but got very nervous and ran off to hide when another group of elephants approached. We walked around the clinic to watch elephants get treated and meet the newest addition, an elephant missing her back foot after stepping on a land mine. Since she was still recovering and struggling to walk, she was confined. I didn’t realize these elephants had literally been rescued. Down by the river we got to meet a huge elephant who was happy to stand for photos in exchange for a big pile of fruit. We could really walk up to whichever ones we wanted to pet them or feed them, and they were really interactive reaching out their trunks for a hand or food. 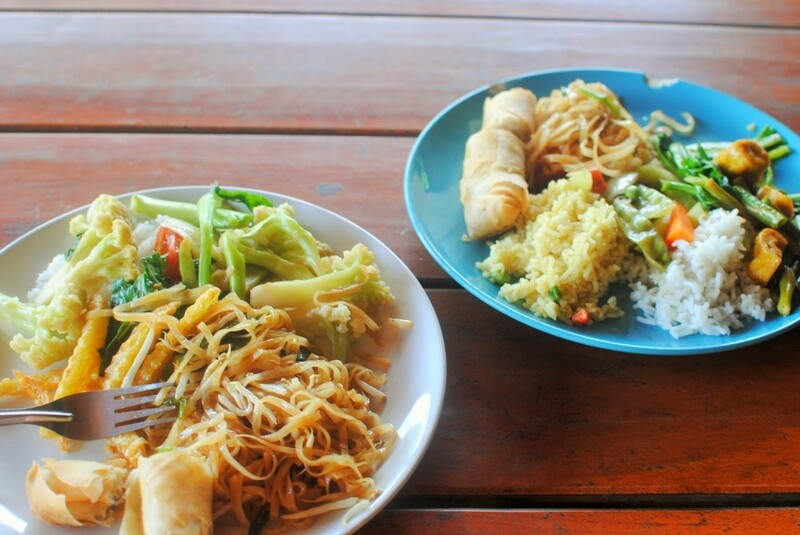 Another nice thing about this experience is that although a bit more expensive, they feed us lunch. 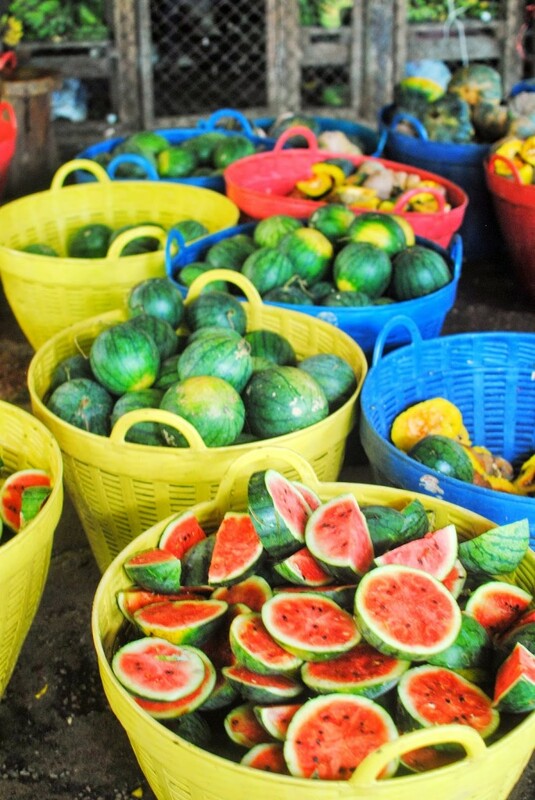 Our money is used to buy produce from the local village to feed the elephants and visitors. Any remaining money after taking care of the park’s expenses is used to fund the nearby schools. After lunch we went down to the river to wash the elephants. 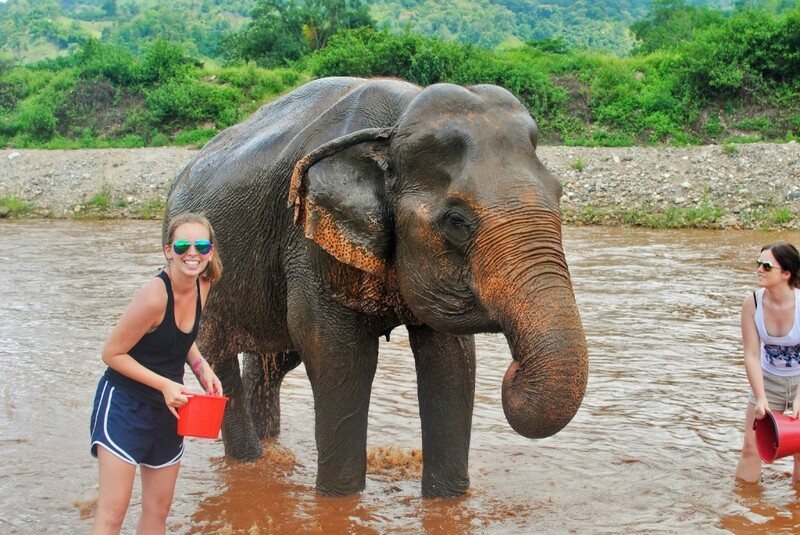 We got to splash water on them but one particular elephant decided she was more efficient than we were and ran deeper into the river to spray herself and splash around. 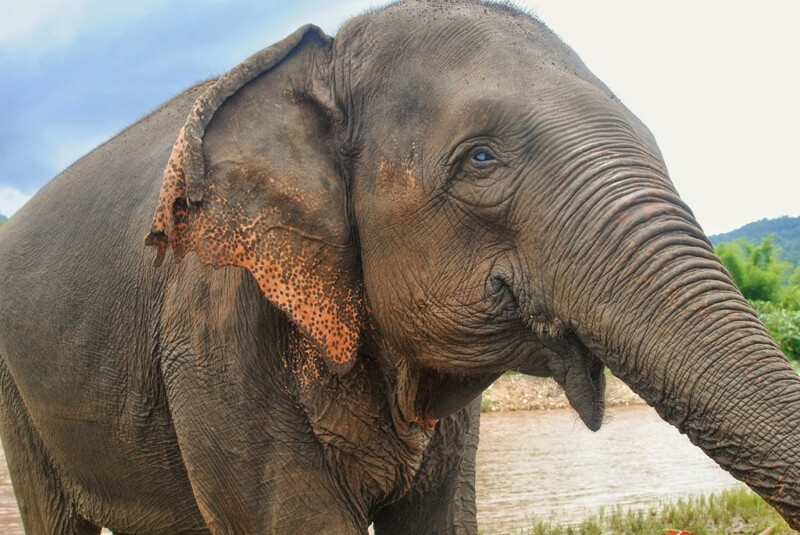 Each elephant is assigned a caretaker that stays with them at all times. It seemed like they may have been there to keep us safe at first, but after watching a few of the visitors make dumb decisions I think they were to protect the elephants from us! 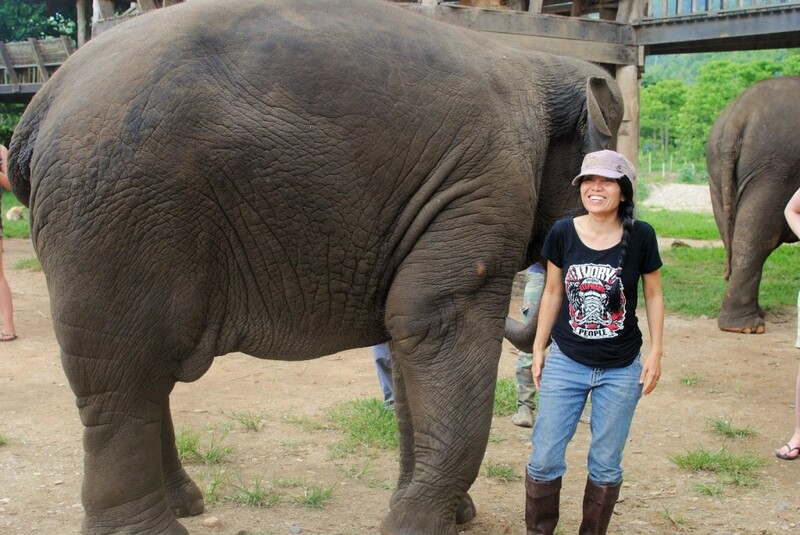 Afterwards we finally got to meet Lek, the woman who has rescued and bought all 40 of the elephants at the sanctuary. 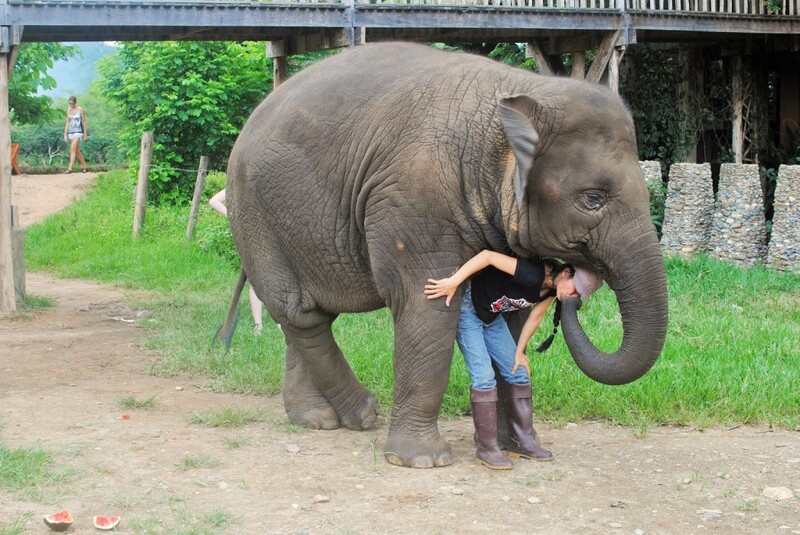 She is a tiny lady and blends in with the visitors but the elephants quickly found her and headed over to wrap their trunks around her and pull her in for hugs. It was cool to see that they knew and recognized her. Before leaving we stopped by to meet the youngest baby who was making a mess of himself eating. Absolutely adorable. Soon the sky opened up and poured down so we ran for our van and headed back to Chiang Mai. 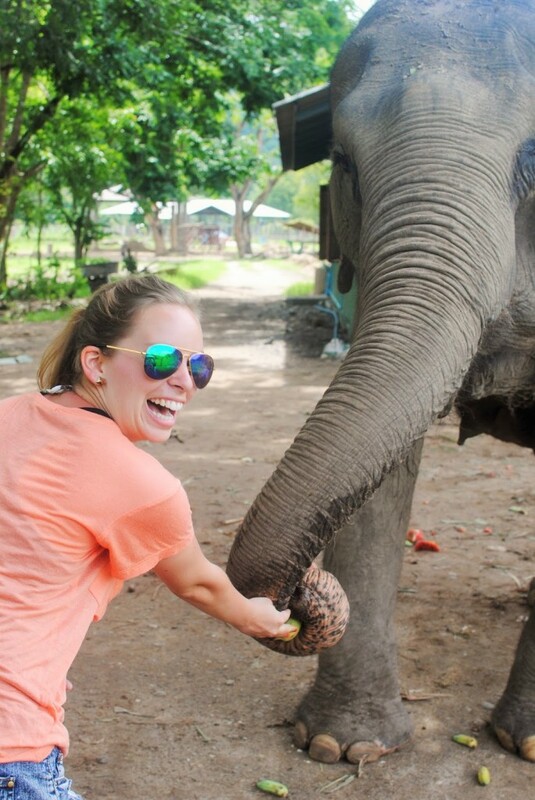 I would definitely recommend this to anyone interested in seeing elephants in Thailand and although you don’t get to ride them, you spend so much more time interacting with them than you would at a tourist elephant camp. I have even had the chance to ride an elephant since and just don’t have an interest after seeing the injuries they sustain from working for years. What beautiful photos! Looks like an amazing way to spend the day! Would love to be that close to them! I can’t recommend the ENP enough Jaclyn! If you get the chance, you should visit!